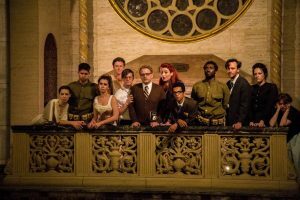 Set in a 19th-century marble Mausoleum in Altadena, the powerful conclusion to The Speakeasy Society’s THE JOHNNY CYCLE: Part III – The Living is immersive theater at it’s best. Here you are surrounded by the human remains and heart-felt memories that have been left abandoned. A perfect setting for what’s to come. As you wait for the play to begin, wine and beer is served in the courtyard. Visits to the bathroom prior to the show are in groups, escorted by production staff. Thank you for that because you soon realize it would be very creepy to get lost in this foreboding monument to the dearly departed. And then it starts. The audience is told that we are extras in a film. 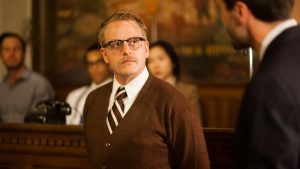 It’s a funeral scene and we’re instructed to cry on every take as the blacklisted Academy Award winning writer, “Dalton Trumbo” types away nearby, finishing Johnny Got His Gun, the novel that was the genesis for this masterful production. Audience members are soon separated and suddenly we “become” Johnny, the title character. All of us are addressed that way as we are plunged into the tragic story of this once innocent young man – now a damaged war survivor. Scenes begin to play out in various locations throughout the mausoleum. An office, an apartment, a courtroom, a picnic and more. Some audience members are selected for one on one encounters with the cast. While my friend was being interrogated by “Stripling,” a rabid Communist hunter portrayed by a powerful Michael Pignatelli, I was in a dimly lit closet side by side with “Yuri,” (an intense Michael Bates), his eyes burning into mine as he tells me how I, (“Johnny”) left him to suffer on the battlefield. All I can do is mutter “I’m sorry” before being sent back to join the rest of my group who are now wearing party hats and sipping champagne as they celebrate Dalton Trumbo’s birthday. As the show progresses we meet other significant figures in the title character’s life. Among them his grieving mother, (a memorable Jenny Curtis) his innocent girlfriend, (Colleen Pulawski) and “Lucky,” a scantily dressed prostitute well portrayed here by Julia Henning. The Johnny Cycle gets most everything right. Costumes by Felicia Rose and production design by The Speakeasy Society are distinctly authentic, but it’s the fine performances that really leave an impact. Some are downright haunting. Other members of this excellent troupe include Matthew Bamberg-Johnson, Jonathan Bangs, Zach Davidson, Alex Demers, Christie Harms, Zan Headley, Jessica Rosilyn, Chynna Skye and James Cowan. 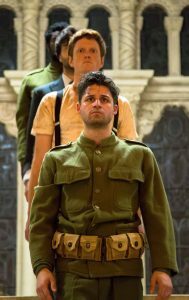 Written by Julianne Just and Chris Porter, (the latter also composed the music), and directed by Ms. Just and Genevieve Gearhart, the show enables an audience to ponder questions of personal choice as well as experience the hurtful impact of war – not only those who are required to fight, but also those who are left behind to pick up the shattered pieces. If immersive theater is your thing and you’re looking for a visceral pick-me-up, this Johnny is definitely the one to see.